Back in April, just over a month ago, I asked you which type of gamer you were: PC, Console, a bit of both, and everything in between. The results I got were pretty much what I expected. Of the 35 of view who took time to vote, a bit more than half (19 - 54%) are PC Gamers, me included in there. About a quarter of you (8 - 23%) are 'More PC Gamers then Console Gamers', and the rest are either equally both (5 - 14%), or more console gamers (2 - 6%). Only one played more console games then pc games. So there you have it. As for me, as I've stated, I'm a PC Gamer first and foremost, though my XBOX 360 has it's place in my home. I use it mainly use it for first-person shooter such Halo, Gears of War or Ghost Recon. But since the rest of the games I enjoy are either RPG (Neverwinter Nights and Dungeon Siege), RTS (Starcraft, Battle Realms, 1701 A.D. and Homeworld) or MMORPG (EVE Online, GuildWars, Dungeon Runners) I tend to find that the PC is the better platform for those types of games. What about you? I'd be interested in knowing. Just finished listening to the latest Live Dev podcast. Quite interesting and funny. Over all, I can say that I'm glad that CCP will be putting more emphasis on the storyline through the White Wolf acquisition. With White Wolf working (oooh 4 "w" in a row, is that spooky or what!) on lore books and all, the future looks promising for us roleplayers and scifi geeks. They plan several books that will expand on the past, current, and future EVE storyline. Speaking of which, a new chronicle is now available, "Post Morten". A good, though I read better. It'll really be interesting to see what WW can come up with. I've always wanted to compile all the EVE Online chronicles into one document, one book that I could read at my leisure and not necessarily in front of a monitor, but wherever I chose. Well, not only was I not the only one, but I was also late by a couple of month with my 'bright idea'. Back on the EVE Backstory page are links to two versions of this same book - one with a black background, the other (for printing purposes) in white. I've download both and will have the white-themed one printed and bounded in full colour tomorrow morning when I get downtown. I can't wait to flip through it and read it on the commute back home. I just wished we had more of these great books, and can't wait for Tony Gonzales' novel or the RPG books on EVE from CCP White Wolf! Lots of reading up ahead! 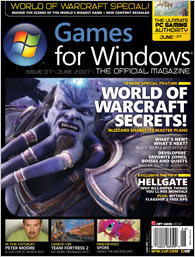 Just finished reading the latest issue of Games for Windows (June 2007) and I must say, I'm still very much impressed with the quality of the content, the articles, artwork and reviews. The four articles that I enjoyed in this month's issue (well actually next month's, since we're not even in June yet...) were "GFW Live", "Inside Blizzard: World of Warcraft" and the Spore and Mythos preview. As a current XBOX Live Gold subscriber, I'm looking forward to GFW Live and seeing the various community possibilities it'll offer. Cross-platform gaming will bring in a whole new aspect to bragging rights and plain fun. And even though I don't play WoW, I was still very much interested in the story behind it's phenomenal success. I'd be first in line to buy a book on the subject. Something along the lines of "Dungeons & Dreamers: From Geek to Chic", a book I thoroughly enjoyed reading. As for the two preview, I can't wait to start building organisms and see them evolve in Spore - it's just to bad EA delayed the game until 2008. And I've signed-up for the next Mythos' Beta testing phase. This last one looks like a lot of fun, with some heavy flashbacks to my days of Diablo 2 and carpel tunnel syndrome episodes (thank god for Myoflex). I spent the better part of the day updating the various of sites on my blog. The Blogroll, EVE Online News, Reference, Tools & Guides, Screenshots, Corporations and Alliances section have all had additional links added and old broken ones removed. I've added a bunch after reading through my last issue of EON, those I found in the EON Awards nomination article. Most I already add, but some good new ones I was surprised to find. If you know of good sites that are not listed here, then please let me know so that I may add them. I try to keep up, and only list sites that get updated regularly. So unless the site is well done and current, I might not list it here. Otherwise, please leave me a comment with the site url. As you read this, I'm on my way back to Gallente Federation space. Though I have not officialy left Phoenix Propulsion Labs, I've cleaned out my hangars, sold what I need and could and packed what I could. On my way back out for a last trip, just as I was leaving the station in Badivefi I got podded by a gang of 6 pilots from PURE Legion, who were sitting there and not only lost a Dominix, but its full cargo! They'll pay one day, you can mark my words. Oh they'll pay. I just hate waking up in a new clone. It's just so akward and disorienting to wake-up in those clone labs. But ehm who am I kidding, I'd rather feel nauseated then be dead. I just never got used to it. So I boought a shuttle and undocked. I was going to see if these PURE suckers were fast enough on the trigger. As my shuttle exited the station, I hit the engines full speed and as soon as I was clear I engaged the auto-pilot. They never had a chance to target me! But when I got at the gate, a little Pure party was waiting to say goodbye. This time they locked on me, and started bombarding me hard. Not hard enough though. And by the time I jumped, I had only lost shields and half my armor. These bozos couldn't even get a shuttle for crying out loud. "Les pourris!!" as grandpa used to say. So now, I've got about twenty-something jumps left to get to Grinacanne, on the edge of the Federation. Dad's gonna be happy to see me! I've already dropped my Vexor and all that it could carry. So I just have to get myself there in one piece. Khanid was fun, and PPL was a great place to work. But home is home, and you can't take the Gallente out of this girl. See you on the other side!